President and CEO Frederica Williams is named Top 50 Power Player on Boston Business Journal’s 2015 Power 50 List. Boston Business Journal cites Ms. Williams as a key innovator who is “getting things done and leading change in the Boston economy.” Whittier Street Health Center proudly congratulates Ms. Williams. As the Journal states, “this was a tough list to compile, most notably because Boston’s economy just keeps getting better – and the number of powerful Bostonians is increasing.” Read Robin Washington’s article on Ms. Williams and learn why she is known as “Whittier’s Health Care Hero”. Frederica M. Williams, president and CEO of Whittier Street Health Center. Education: Diploma in administrative management, Institute of Administrative Management, United Kingdom, 1982; graduate certificate in administration and management, Harvard University Extension School, 1991; MBA, Anna Maria College, 1994. Did you have mentors along the way in your career? I would say my parents. My father instilled confidence in me. My mother instilled in me humility. She didn’t want me to be so cocky and take what we were born into for granted. Who do you turn to for advice today? The first person I look to every day is Jesus Christ. I’m strong in my faith. I pray a lot for direction. And then I surround myself with people who aren’t afraid to tell me the truth. That includes my 18-year-old, who will tell you the brutal truth. I talk to him every morning and night, too. You could say Frederica Williams didn’t know what she was getting into when she embarked on a building campaign a year after taking over Roxbury’s historic but fledgling Whittier Street Health Clinic in 2002. Or you could let her say it. “I was grateful … it took such a long time — 10 years — to raise the money and complete the building, because it gave me a better understanding of what the issues are,” she says of the 79,000-square foot Tremont Street facility across from Boston Police Headquarters that opened in 2012. Started as a baby care clinic in 1933, Whittier Street today offers primary health care to 28,000 mostly inner-city residents, up from 5,000 when Williams took over. A native of Sierra Leone, the mother of three grown sons and the daughter of well-to-do parents, Williams spent much of her early life in London. Alas, Boston is her adopted home. 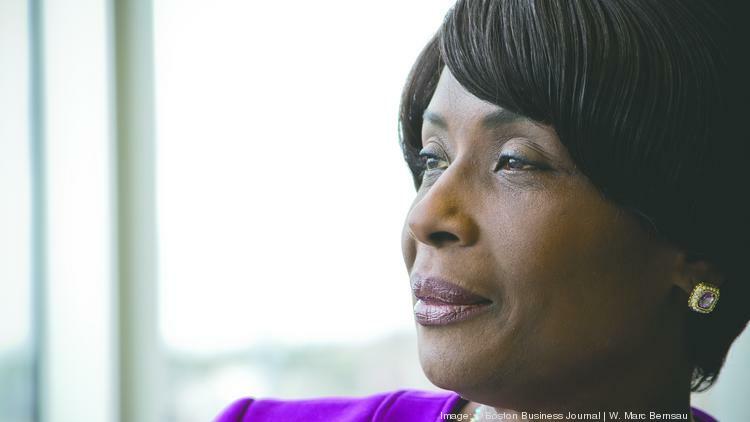 She recently spoke with Business Journal correspondent Robin Washington. Do you find that many patients are confused about what their health care options are? Yes. Much of what we do is around education. We’re promoting wellness and prevention. We classify our patients based on risks. We know who’s high-risk, who’s moderate-risk, who’s low-risk. You may have a chronic disease and be low-risk, and the reason we classify you as low-risk is you’re compliant, you come in for your visits, you’re taking your medicine. If you’re high-risk, the team could include a high-risk nurse. Part of reducing risks is having people understand and use the system the right way. We have an emergency care clinic because we’re trying to keep the people out of the emergency room. Community-based care works because we know the community. What’s your favorite place to visit in the world? London. Only because my parents had this bright idea (of sending her to school there.) I said, “Why would you want to pick me from this beautiful tropical weather (in Sierra Leone) and send me there?” They had vision. What’s on your download list? I love to dance and sing, even though I shouldn’t be dancing and singing because I don’t have the voice for it. It’s all Motown, Caribbean music and disco music. I could listen to disco music all day. Also, I exercise every day. It helps me balance my stress. I helps me prevent illness. I also do meditation and yoga. The other part is diet. Everyone wants a miracle cure, but the only miracle is diet and exercise. Yes. You cannot exercise your way to thinness. It depends on what you eat. Your bio says you have a passion for philanthropy. How do you get past the basic fear of asking? A lot of good people want to connect with good causes. They need to see the investment is worth their while, that they’re not just giving to people that don’t want to take care of themselves. I do my fundraising from a business point of view. It has to be a win-win for people. My mother was an entrepreneur and philanthropist. We were all taught to give back. My mother could ask anybody for anything. You picked it up? I picked it up. I was taught by the best.